Book-plate image, from Our Cats and All About Them (1930) by C.A. House, courtesy of The Harrison Weir Collection. Advertisment from Cat Gossip, March 2nd, 1927. From the collection of Karen Lawrence. 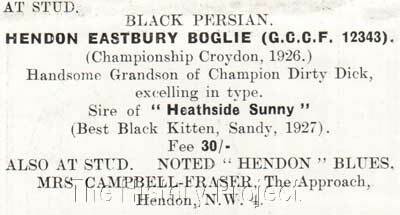 Advertisment from Cat Gossip, September 7th, 1927. From the collection of Karen Lawrence. Photos as per sources quoted.